Arrive Livingstone, Zambia where you are met and escorted to your hotel. This afternoon enjoy a sundowner cruise on the Zambezi River. 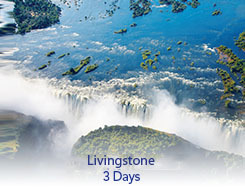 Please Note: The Falls on the Zambian side may dry out seasonally (Sep – Dec). During this time we recommend you also view the Falls on the Zimbabwean side (extended day tour available).